The top diplomats of South Korea and the United States vowed Saturday to make joint efforts to maintain the momentum for dialogue with North Korea after the cancellation of the US envoy's visit to Pyongyang, the foreign ministry here said. On Friday (Washington time), US President Donald Trump said in a Twitter message that he had canceled Secretary of State Mike Pompeo's trip to North Korea slated for next week, citing a lack of progress toward resolving the North's nuclear issues. Pompeo "looks forward to going to North Korea in the near future, most likely after our Trading relationship with China is resolved," Trump said, while expressing his hope for seeing North Korean leader Kim Jong-un again soon. 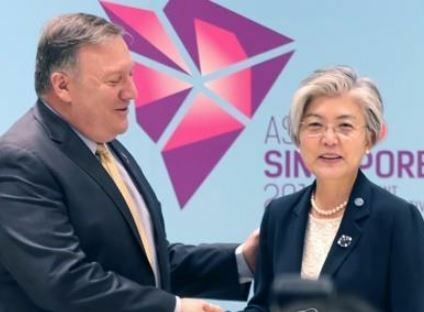 In a telephone conversation early Saturday, Pompeo briefed South Korean Foreign Minister Kang Kyung-wha on what led to the cancellation of his planned visit, and suggested close consultations to set their future direction together, according to the ministry.